Dr. Una Osili is Director of Research at the Indiana University Lilly Family School of Philanthropy. 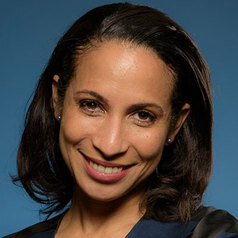 An internationally recognized expert on philanthropy, Dr. Osili frequently speaks across the country on issues related to national and international trends in philanthropy and has been quoted by national news media outlets such as The New York Times, the Chronicle of Philanthropy and Nonprofit Times. She has served as a member of several national and international advisory groups, including the Social Science Research Council, the United Nations Economic Commission for Africa and the United Nations Development Program. In 2006, she received the Stevenson Fellowship from the Nonprofit Academic Centers Council. In 2007, she was appointed as a fellow of the Networks Financial Institute. Dr. Osili previously served as the Interim Director of Research and has been the Director of Research at the Indiana University Lilly Family School of Philanthropy since 2009. Dr. Osili is the current Chair of the Research Committee of the Women’s Philanthropy Institute, and is a member of the Research Committee of the Lake Institute for Faith and Giving. She leads the School’s extensive research program for its partners including Bank of America, United Way Worldwide, United Student Aid Funds, the Alban Institute, and National Collegiate Athletic Association. Dr. Osili provides guidance for the research for Giving USA, which is published by Giving USA Foundation. She also directs the School's signature research project, the Center on Philanthropy Panel Study (COPPS). COPPS is largest and most comprehensive study of the philanthropy of American families over time, and is conducted in partnership with the University of Michigan's Panel Study of Income Dynamics (PSID). In addition to her appointment at the Indiana University Lilly Family School of Philanthropy, Dr. Osili serves as Professor of Economics and Philanthropic Studies at Indiana University Purdue University, Indianapolis (IUPUI). She is also a member of the graduate school faculty at Indiana University. In 2007, she was a Visiting Associate Professor of Economics at Yale University. Dr. Osili is a consultant with the Federal Reserve Bank of Chicago, and has worked for the World Bank and also serves on the Research Committee of the Association for Research in Nonprofit and Voluntary Organizations (ARNOVA) and the Board of the African Finance and Economics Association (AFEA). She has served as a past or current board member for several nonprofit organizations, including the American Red Cross of Greater Indianapolis, the Immigrant Welcome Center, and is a member of the Board of Trustees of St. Richard’s School.